At B.A. Ramirez & Sons Ornamental Iron Works, Inc., we are a family-owned and -operated business that specializes in iron fences, gates, railings, doors, and window guards. We have over 30 years of experience providing excellent service, high quality workmanship, and great value to thousands of satisfied clients in San Diego County, including Alpine. 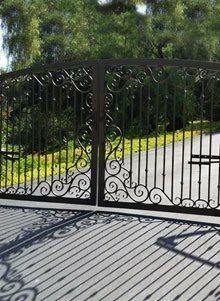 Our beautiful, artisan-crafted, expertly-installed fences, railings, gates, and doors are constructed to last, and our skilled craftsmen are experts at working with both ornamental and wrought iron. We construct all of our ironwork in strict compliance with all applicable homeowners association CC&Rs and municipal building codes, and our experienced craftsmen work closely with our commercial and residential clients throughout all stages of their projects. In addition, our owner, Mike Ramirez, personally supervises each and every one of our projects, from inception through completion, regardless of whether it is large or small. B.A. Ramirez & Sons prioritizes customer satisfaction at all times. That's why our custom-designed iron fences, gates, railings, doors, and window bars in Alpine are made according to the industry's highest standards. We'll work with you, whether you have a complete sketch or a loose idea, and create a proposal to fit your budget and functional requirements. Additionally, we provide upfront quotes, written warranties, and honest, professional service. 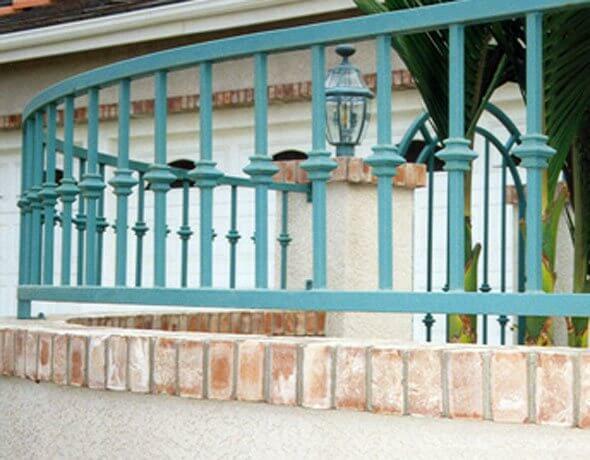 As a result, we've become one of the most highly recommended iron fence fabricators in the San Diego area. Call us today to learn about the comprehensive ironwork services we provide throughout the Alpine area. Whether for a new fence, gate, railing, or door installation, replacement, or repair, B.A. Ramirez is happy to assist you. We are licensed, bonded, and insured. Since 1980, B.A. 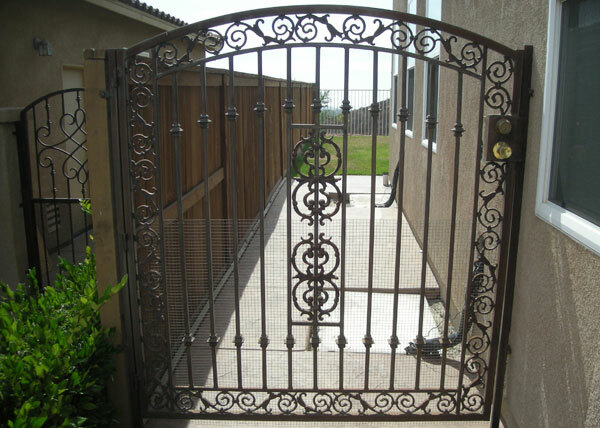 Ramirez & Son Ornamental Iron Works, Inc. has created beautiful, functional, expertly-crafted iron gates, fences, railings, and security doors and windows in Alpine at affordable prices. While all of our commercial ironwork is custom designed and fabricated, we still manage to keep our prices very competitive. Alpine businesses can choose from decorative or wrought iron fences, gates, doors, and railings, as well as an array of customizations, such as ornate scrolls, latches, knobs, handles, levers, privacy-enhancing backings, and powdercoat finishes in an array of colors. We also offer a wide selection of options for our motorized gates, such as automated control features, intercoms, card readers, and other access controls. Whether you need a fence to enclose your commercial property's perimeter or to fence off various aspects of your property or business, we will design our iron fences to work perfectly according to your needs. With a range of security options available, you can make your Alpine property secure without sacrificing your building's beauty: Our popular spear-topped fences deter trespassers as well as enhance the appeal of your business. We also offer a range of safety-enhancing features, like railings, window guards, and security doors. Commercial clients can further rely on us for handicap rails that conform strictly to ADA code. If you need an iron fence, gate, handrail, door, or staircase railing in Alpine for your business property, contact us today and set up a free design consultation or online estimate. When you choose B.A. 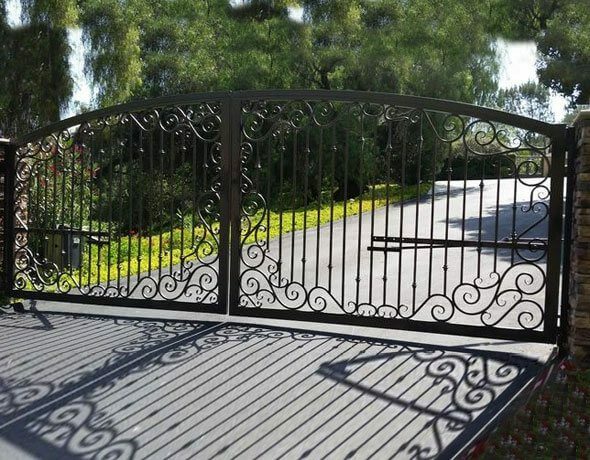 Ramirez Iron Works you can trust that we will work closely with you to design a custom decorative or wrought iron fence, gate, door, railing, or window guard for your Alpine home. We can craft your project out of a wide range of iron types, and design it to complement your property as much as it serves its functional purpose. Our employees are all highly experienced craftsmen and skilled at working with both tubular and solid iron. They can hand forge ornate scrolls, integrate decorative castings, and install brand name hardware, such as latches, knobs, and levers, as well as automated systems. We further offer metallization, hot-dipped galvanization, powder coat finishes (our finishes are available in hundreds of colors), and sprayed-on epoxy liquid finishes (which let us custom match any color). With our wide range of design options, you are sure to get the perfect iron fence, gate, railing or window bars in Alpine for your needs and budget. Our beautiful iron fences and gates add simple, elegant style to your Alpine home while also providing security. 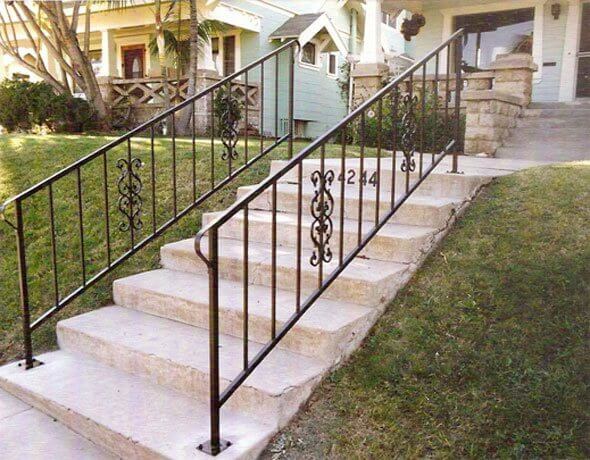 We craft and install attractive, functional interior and exterior railings for stairs, balconies, and handicap use. We can create inclined railings as well as wine cellar gates, pool fences, and outdoor enclosures, and we can work with you to design security window bars that will enhance your home's exterior while also providing security for your family and guests. Call today to learn more about our residential iron fences, rails, gates, and doors for Alpine customers. With more than 30 years of ironwork experience, B.A. Ramirez & Son Ornamental Iron Works, Inc. can custom-design, build, and install any type of iron fence, including security fences, privacy fences, property fences, pool fences, front-yard fences, wall-mounted fences, and more. Although we specialize in installing new, custom-designed iron fences, we also repair and replace existing iron fences in Alpine. Whatever your iron fencing installation, repair, or replacement needs in Alpine, we'll always provide you with dedicated customer service, expert craftsmanship, competitive pricing, and written warranties. Customers in Alpine can count on our iron fence fabricators to create any style of iron fence to enclose their residential or commercial properties, from a simple, standard iron fence to a custom-designed, highly ornate iron fence. Most residential property fences in Alpine are designed to enclose a yard, but we can also make fences for pet enclosures, gardens, pools, or decorative purposes. In addition, we have a proven track record of providing strong, effective, as well as affordable iron security fences, security gates, and doors in Alpine. In addition, because iron fences are naturally difficult to climb, they make an excellent security perimeter for any Alpine residential home or commercial building. Our iron security fences can be further customized with spears, spikes, or other deterrent toppers to further discourage intruders, and we offer an array of access control systems for iron gates and doors. Contact today for a free consultation and online estimate. B.A. 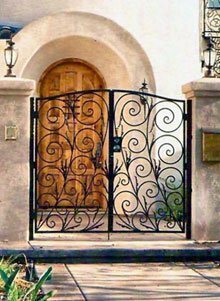 Ramirez & Son Ornamental Iron Works, Inc. has decades of experience designing, crafting, and installing beautiful, affordable iron entry, security, access, and decorative gates in Alpine and beyond. We work with both commercial and residential customers and have been serving the larger San Diego County area since 1980. To ensure your iron gate serves your aesthetic preference and functional needs, we custom design each and every element. We offer a diverse range of options, from solid steel and tubing to hundreds of powder coat finish colors, and comply with the industry's highest expectations for fabrication to ensure our customers get the perfect iron gate for their Alpine home or business property. We also install motorized access gates with intercoms, card readers, automation controls, and other access control systems, all of which we purchase from leading brands. Whether you need to install a gate to control access to your driveway, entryway, pool, yard, pasture, industrial property, private community, or commercial building in Alpine, contact us today. When you are looking to install an automatic gate in Alpine, make sure you call B.A. Ramirez & Sons. Installing, repairing, and replacing automated driveway and entryway gates is where we truly excel. Not only do we have the capacity to realize any iron gate design and have it fit nearly any width, but we can also have it function exactly as you wish. We can install any of the automatic gate opener systems made by LiftMaster, DoorKing, Elite, All-O-Matic, Linear, RamSet, and other leading brands. Automatic gate openers make it possible for gates to swing or slide open reliably, safely, and conveniently. They're also backed by substantial manufacturer warranties. Call today for a free consultation on motorizing your new or existing gate in Alpine. By relying on B.A. 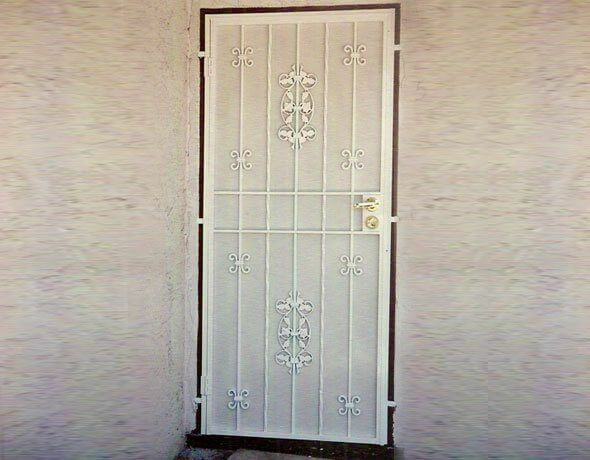 Ramirez & Son Ornamental Iron Works, Inc. you can rest assured knowing our craftsmen have the skills and expertise to custom-design, build, and install any type of iron security window guard or iron security screen door. Alpine customers love our iron window guards because they are both attractive and functional. 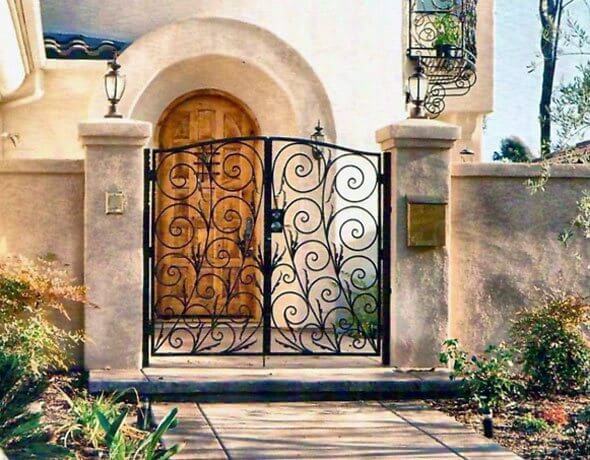 Designs can include code-approved fire releases, as well as many of the same options available on our iron gates, such as straight bars, heart scrolls, modern designs, and fleur de lis designs. 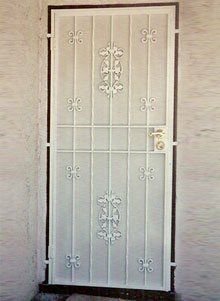 For those looking for an iron security door in Alpine, we can design and fabricate one out of heavy steel frame construction and install it to fit your door's opening. Alternatively, we can design an entry door that keeps visitors away from your front door. Our entry doors (sometimes called a decorative enclosure) look elegant, but offer greater security. When installing this type of door, we can also install an intercom or telephone entry system that lets you control access through your landline or smartphone. Contact us today to schedule a convenient appointment time and our friendly employees with go over our many options for iron security doors and iron window guards in Alpine. B.A. Ramirez & Son Ornamental Iron Works, Inc. custom-designs iron railings in Alpine for balconies and stairs. Our iron railings are available in both simple and highly ornate designs, and we excel in building iron railings for spiral, wrap-around, circular, and rounded stairways. 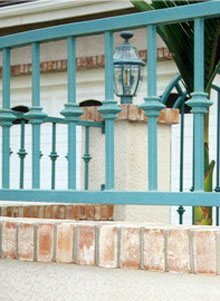 For our ornate iron railings in Alpine, we offer optional balusters, scrolls, knobs, baskets, knuckles, leafs, collars, rail caps, crown caps, and many other decorative features. Our iron railings are further available in your choice of hand-forged or cast iron materials, ensuring we offer options to fit every project budget and need. 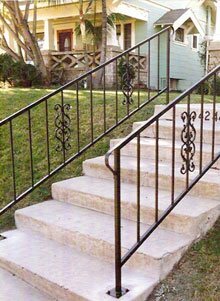 We offer our railings in your choice of iron types, including standard, ornamental, metallized, or galvanized iron, and can finish your iron in a powder coat finish, which is available in a wide range of colors. We are further able to create custom, epoxy liquid finishes that allow for color matching. 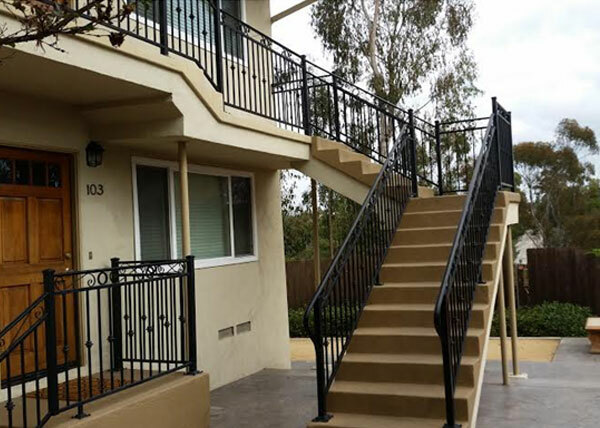 With our wide range of design options, you can truly find the perfect iron railing for your needs in Alpine at an affordable price. 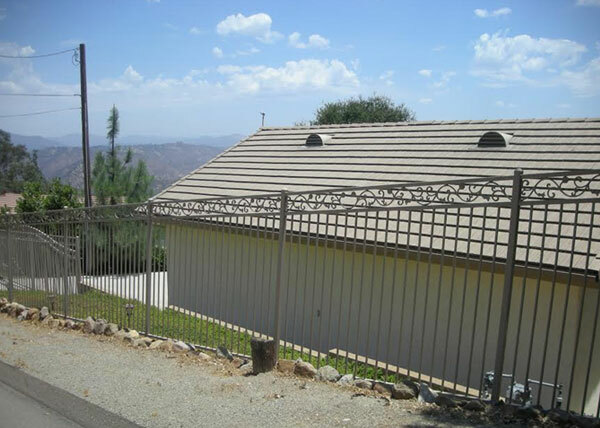 F13 We installed this residential steel fence in Alpine, CA. This six foot high custom fence is made from 2" steel tube posts, 1" steel tube horizontals, and &frac58;" verticals with decorative casting designs below the upper horizontal. Our client was very happy with their simple yet beautiful steel property fence. G12 We installed a Mediterranean style side entry gate in Alpine, CA. The steel gate features ornate cast aluminum Pontalba castings along the frame of the gate, two rows of decorative knuckles, and a powder coat paint finish.